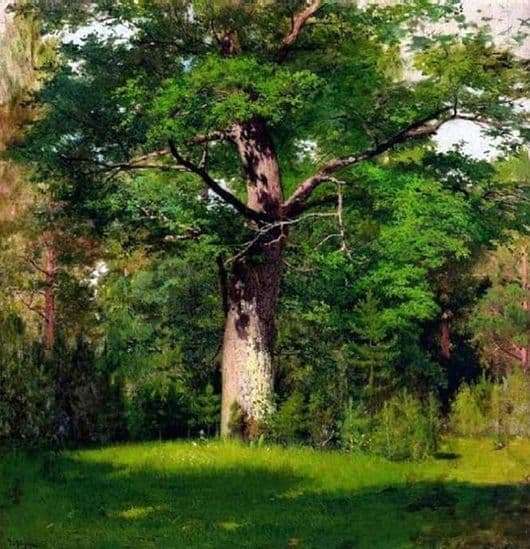 Landscape made by Levitan called “Oak” is very close in its compositional construction to the same picture with the same name Savrasov. The picture is very rich in a variety of colors, which can also be compared with the works of Polenov. Having written a very powerful and large oak tree growing on the edge of the forest, the play of light of it crawls over its leaves, illuminating them with colors and flowing in the heated air. Thus, Levitan was able to perfectly convey the most delicate tone of still young grass at the very base of the oak, together with golden yellow and orange color in some places, which comes from resinous pines that stand around the oak, and an inimitable play of shadows on the branches and trunks of trees. When the viewer sees this work of art for the first time, he immediately understands the whole essence of art and its amazing depth of possibilities. It’s no secret that Levitan preferred autumn landscapes more often, it is much less common to find paintings devoted to the springtime of the year, and very rare, to meet the landscape, caught unawares at the height of summer. Naturally, the main character of the landscape is an oak tree, which stands on the edge of a forest surrounded by conifers. Oak widely spread its branches, and its bark just shimmers and gilded in sunny color because of its thick and lush crown, only in some places the sunlight has the ability to penetrate the dark green foliage. Because of this, under it you can see the semblance of a golden nimbus. And this dry branch gives this picture, and oak in particular, even more realistic. Oak eclipses all other trees with its natural beauty, even if it would not have been brought to the fore. The power of the oak also give such petty pines and a flower, which is located at the very foot. Oak is always associated with power, strength and strength.